Want to connect with Nermin? If you have any questions please feel free to contact me, I'm looking forward to meet you and your children. 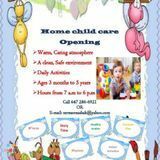 Child and youth care college student with professional and personal child care experience, looking for part time job!